Happy Veterans Day to all who are serving and those who have serve in the Armed Services to keep our way of life. Freedom is not cheap. Here is a little history on Veterans Day. Veterans Day is observed annually in the United States on November 11. The holiday honors all those, living and dead, who served with the U.S. armed forces. The holiday was originally called Armistice Day, and it commemorated the end of World War I on November 11, 1918. Fighting stopped at 11 am, the 11th hour of the 11th day of the 11th month. In 1919, on the first anniversary of the World War I armistice (truce), President Woodrow Wilson issued a proclamation expressing pride in the heroism of those who had died during the war. Business stopped for two minutes starting at 11 am, and it later became customary to observe two minutes of silence from 11 am. Many states made Armistice Day a state holiday in the 1920s and 1930s, and in 1938 the Congress of the United States declared it a federal holiday. In 1954 the name of the holiday was changed from Armistice Day to Veterans Day to honor those who had served in World War II (1939 – 1945) and the Korean War (1950 – 1953). Today, the holiday honors all veterans. In 1968 Congress changed the date of the holiday to the fourth Monday in October to give Americans a three-day weekend. But because of the significance of November 11 to many people, the traditional date was restored by law in 1978.Veterans Day is marked by parades and speeches and by formal ceremonies at the Tomb of the Unknowns at Arlington National Cementary in Arlington, Virginia. Congress voted to establish the tomb in 1921, and since that time unknown soldiers from several wars in which the United States has taken part have been buried in it. On Veterans Day, the president of the United States or a representative of the president traditionally places a wreath on the Tomb of the Unknowns. 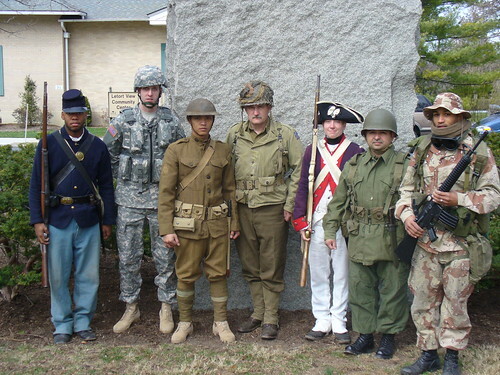 These uniforms represent service members from the Revolutionary war to present. hi eri how are you doing. well it is a pretty cool article because it help people to konw why do this day is a holiday. it is pretty cool.sincerely i didnt know what it means this day . In order, from left to right. 2. Not sure! Is this the current war in Iraq? Oh, and that’s my favorite uniform, not favorite war. I don’t think I have a favorite war.